Smoked-Fish Dip - A recipe from Savor California, the online showcase for extraordinary gourmet foods and beverages from California. Recipe adapted from Chris Shepherd of Underbelly, Houston, TX. In a large bowl, stir together the mayonnaise, sour cream, horseradish, Worcestershire, mustard, paprika, juice and zest from lemons, Tabasco sauce and cayenne. Stir in the green onions, celery, jalapeños and yellow onion. Using a rubber spatula, gently fold in the white fish until well combined. 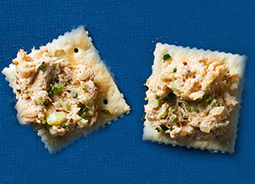 Serve with Saltine crackers and garnish with chives.